APOSS Inter Course is equal to Regular Inter in AP as per Rc Spl.B/ 2016. AP Open Inter equal to regular Intermediate Course. Open School Intermediate Course Certificate is equivalent to the Regular Intermediate course Certificate in Govt. of AP Education Department. APOSS Inter equivalent on and certification and issue Intermediate (APOSS) Pass Certificates, the certificates shall be equivalent to Intermediate Pass Certificates issued by the Board of Intermediate Education as per Rc.No:Spl.B/ 2016 dt. 11 -07-2016. Sub: A.P. 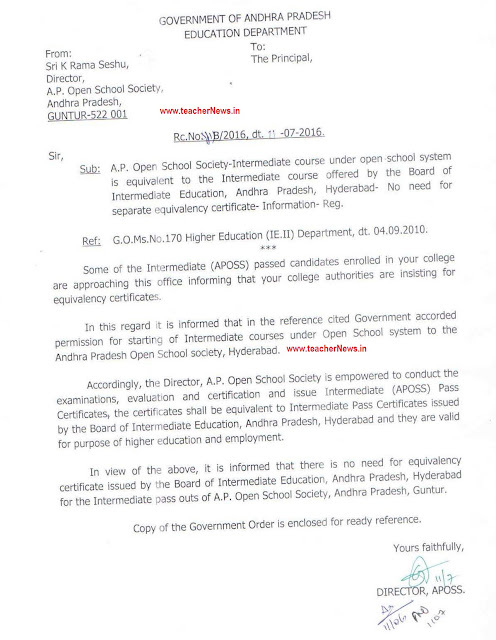 Open School Society-Intermediate course under open school system is equivalent to the Intermediate course offered by the Board of Intermediate Education, Andhra Pradesh, Hyderabad No need for separate equivalency certificate Information Reg. Ref : G.O.Ms.No.170 Higher Education (IE.II) Department, dt. 04.09.2010. Some of the Intermediate (APOSS) passed candidates enrolled in your college are approaching this office informing that your college authorities are insisting for equivalency certificates. 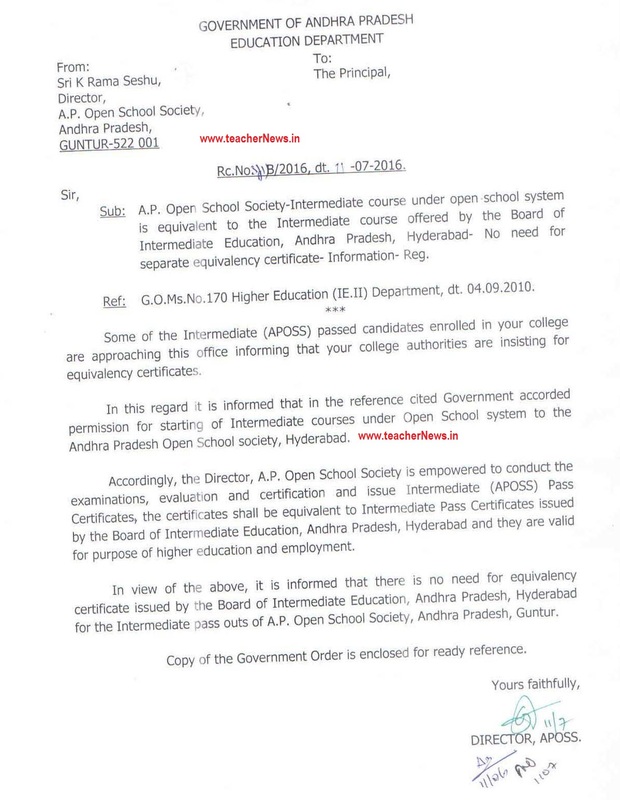 In this regard t is informed that in the reference cited Government accorded permission for starting of Intermediate courses under Open School system to the Andhra Pradesh Open School society, Hyderabad. Accordingly, the Director, A.P. Open School Society is empowered to conduct the examinations, equivalent on and certification and issue Intermediate (APOSS) Pass Certificates, the certificates shall be equivalent to Intermediate Pass Certificates issued by the Board of Intermediate Education, Andhra Pradesh, Hyderabad and they are valid for purpose of higher education and employment. In view of the above, it is informed that there is no need for equivalency certificate issued by the Board of Intermediate Education, Andhra Pradesh, Hyderabad for the Intermediate pass outs of AP. Open School Society, Andhra Pradesh, Guntur. Copy of the Government Order is enclosed for ready reference. Recently, I went to A.C.College at Guntur for the admission of a Degree Course. But they insisted saying that they compulsorily needed the Equivalency Certificate for Admission. So, will the above copy suffice for it?